Table 1 from Legislative report: Earthquakes of magnitude 6.0 and greater in the southern California region, including northernmost Baja California (identified as "BC"), 1912-1971. Compare to Figure 1 on this page. Fig. 1. Earthquakes of magnitude 6.0 and greater in the Southern California region, 1912-1971. From "The San Fernando Earthquake of February 9, 1971, and Public Policy," Special Subcommittee of the Joint Committee on Seismic Safety, California Legislature, July 1972. Note: The San Fernando earthquake is commonly known as the Sylmar earthquake. Its epicenter was in the Santa Clarita Valley. It struck at 6:00:41 a.m., lasted about 60 seconds, killed 65 people (primarily in the San Fernando Valley) and caused more than half a billion dollars in damage to both valleys, including the collapse of the fairly new freeway bridges in the Newhall Pass. The Legislature's report gives a magnitude of 6.4, but it was subsequently assigned a magnitude of 6.6. The California Legislature in 1969 created the Joint Committee on Seismic Safety which, in the words of its chairman, Sen. Alfred E. Alquist (D-Santa Clara), was supposed to develop, over four years, safety plans and policies to "minimize the threat to people, property and the economy from future earthquakes which, experts agree, could strike any part of the state at almost anytime." They didn't get the four years. "Anytime" came Feb. 9, 1971, when the Santa Clarita and San Fernando valleys were devastated by the 6.6-magnitude "Sylmar" earthquake, aka San Fernando earthquake, whose actual epicenter was in the Iron Canyon section of Sand Canyon in the SCV. In response, the Joint Committee established a "Special Subcommittee to Study the San Fernando Earthquake" with the goal of evaluating its effects and learning from it. Chaired by Assemblyman James A. Hayes of Long Beach, the three-person subcommittee included Democratic Sen. Joseph M. Kennick, also of Long Beach, and the Santa Clarita Valley's Democratic Assemblyman, Jim Keysor. For Keysor it was something of an indoctrination. Just three months earlier, Keysor, chairman of the board of Keysor-Century Records (aka Keysor-Century Corp.) in Saugus, had been elected to the Assembly for the first time. In July 1972, the Special Subcommittee published a 132-page report titled "The San Fernando Earthquake of February 9, 1971, and Public Policy." Crafted by a team of expert consultants, it covered geologic and seismic factors; dams and soils; structural engineering of buildings; utilities, communications and transportation facilities; disaster preparedness; land use planning; and government organization and performance. The introduction to the section on "Geological and Seismological Lessons" (pg. 1 of the report) and a technical description of the earthquake (pp. 4-6) follow. They are attributed to Clarence R. Allen, professor of geology and geophysics at the California Institute of Technology (CalTech) in Pasadena, which continues to monitor earthquake activity. The San Fernando earthquake of February 9, 1971, was a geologic phenomenon not unlike many similar earthquakes that occur every year around the world. Within the southern California region alone, the historic record suggests that an earthquake of about this magnitude occurs on the average of once every four years (Fig. 1, Table 1), and in this sense the San Fernando earthquake should have come as no great surprise. Most earlier earthquakes have occurred in the more uninhabited regions of southern California, such as the last event of comparable magnitude, which occurred in 1968 in the Borrego Valley region and did little damage in this sparsely populated area. As urbanization spreads father and farther into the formerly uninhabited parts of coastal California, however, it must be recognized that the frequency of damaging earthquakes will increase, simply for the reason that our vulnerability to damage is becoming greater every year. Furthermore, no recent shocks have occurred within the metropolitan area of Los Angeles itself. Both the 1933 Long Beach earthquake and the 1971 San Fernando earthquake were centered near the outskirts of the city, and we cannot forever continue to be so lucky. In addition, it must be recognized that the San Fernando earthquake was only of moderate size as compared to the truly great earthquakes that have visited California in the past and will undoubtedly do so again in the future. It has now been assigned the Richter magnitude of 6.4 [subsequently upgraded to 6.6 — Ed. ], as compared to magnitudes of more than 8 for the 1906 San Francisco, 1872 Owens Valley, and 1857 Fort Tejon earthquakes. The San Fernando earthquake — like virtually all earthquakes — was caused by sudden displacement of rock masses along a fault. The culprit in this case was a zone of fractures that has become known as the San Fernando fault, which likes along the northern boundary of the San Fernando Valley (Fig. 2). Indeed, previous movements along this same zone within recent geologic time constitute the reason for the existence of the relief between the valley floor and the adjacent San Gabriel Mountains to the north. The fault plane itself is not vertical, but slants back underneath the San Gabriel Mountains at an angle of about 35°, so that although the fault reaches the surface near Sylmar, it lies at a depth of about 4 miles under Newhall, several miles to the north (Fig. 3). Along this fault, which is of a type geologists call a "thrust fault," the San Gabriel Mountains have been pushed (or "thrust") southward and upward over the adjacent San Fernando Valley, and the 1971 earthquake was merely the repetition of the type of event that must have happened many previous times in recent geological history — but never before within the historical record. The maximum vertical displacement observed at any single point along the fault during the San Fernando earthquake was about 6 feet, and there a was a similar component of horizontal movement that moved the mountains west relative to the valley. Along the zone where the fault broke the surface, all structures that had been placed across it were damaged or destroyed. However, it should be kept in mind that this was only a minor cause of damage as compared to the vibratory motion that was an indirect result of the faulting itself. It has been estimated that perhaps only 1% of the monetary loss associated with the earthquake was directly related to faulting through structures; the remaining 99%, including all of the hospital losses [Olive View Medical Center and VA Hospital — Ed. ], was solely the result of heavy shaking which was in turn caused by the fault displacement at depth. These figures are somewhat biased, however, by the fact the surface fault rupture happened to cut through an area predominantly occupied by modest single-family dwellings, whereas the heaviest shaking occurred in an area of numerous major and expensive structures such as hospitals, dams, and electrical facilities. The thrust-fault nature of the San Fernando earthquake, which is indicated both by geologic studies of the structural fault break and by seismologic studies of the earthquake waves originating in the area, is essential to understanding the damage pattern. Figure 2 shows the epicenter of the main shock and of numerous larger aftershocks that occurred in the year following the main event. Two obvious questions are posed by this map: (1) Why is the epicenter of the main shock north and east of Newhall, whereas the principal damage (and heaviest shaking) appears to have been farther south near Sylmar, and (2) why do the aftershocks cover such a wide area? The epicenter of the main shock, by definition, indicates only that the point on the ground surface above which the fault breaking first started. This was at a point (called the focus or hypocenter) about 5 miles beneath the surface (Fig. 3), and there are several lines of evidence indicating that the fracturing then propagated southward and upward along the fault plane until it actually broke the ground surface in Sylmar and San Fernando — along the fault trace shown in Figure 2. That is, the entire fault surface did not break at once, but instead the breaking commenced at one point and then spread out, in this case toward the south. 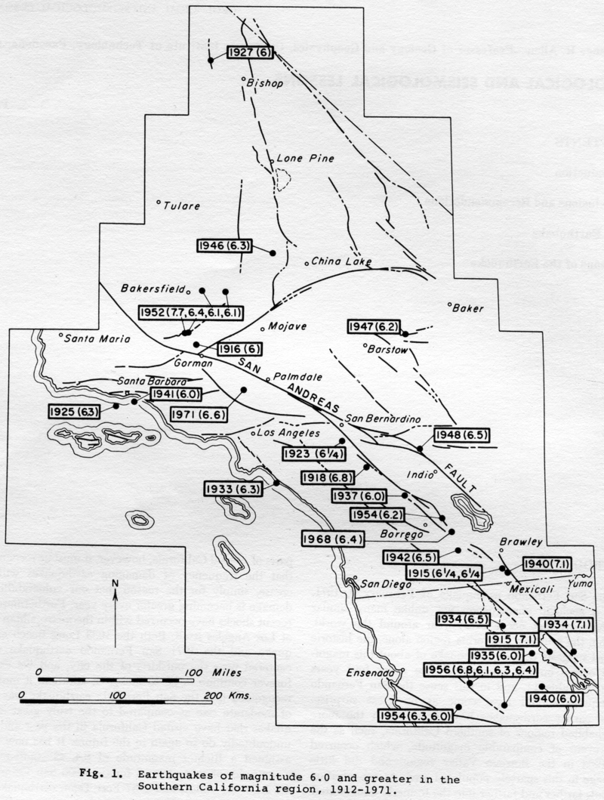 The shaking was heavier in Sylmar than at the epicenter probably for two reasons: (1) the fault plane, whose rupture radiated the energy that caused shaking, was at a much greater depth beneath the epicenter than at Sylmar, and thus farther away, and (2) several lines of evidence indicate that the amount of displacement on the fault was considerably greater near the surface than beneath the epicenter, so that greater energy radiation in the near-surface segment of the fault seems reasonable. In addition, some investigators have argued that local soil conditions in the Sylmar area tended to amplify the shaking in this particular zone. The widespread distribution of aftershocks is not so easily explained, because seismologists do not fully understand why aftershocks occur. Numerous aftershocks follow every major earthquake — sometimes lasting for many years — and it seems likely that they are related to the residual stresses that remain at depth when the fault movement associated with the main shock ceases. Aftershock distribution seems to be related to the extent of the fault plane that slipped during the earthquake, with aftershocks concentrated near the boundaries of the slipped segment. Whereas the epicenter of the main shock reveals only where the breaking first started, aftershock distribution seems to be an important clue to the areal extent of faulting, and thus represents a significant additional source of information. Aftershocks of the San Fernando earthquake tend to be distributed roughly in an inverted "U" with the surface fault trace seeming to cut off the U on the south (Fig. 2). If this distribution is taken to reflect the boundary of the slipped segment as projected on the surface, it suggests a disc-shaped fault of more than 200 square miles area. Inasmuch as aftershocks are, by definition, all smaller than the main shock, considerably less damage is normally associated with aftershocks than with the main event. In some cases, however, very shallow aftershocks some distance from the main activity may cause more damage in a small local area than did the main shock. Such was the case with the so-called Granada Hills aftershock (M=4.9) of March 31, 1971 (Fig. 2), which caused more very local damage in parts of Granada Hills than did the main shock of M=6.4. Similarly, the "Bakersfield aftershock" (M-5.8) of the 1952 Kern County earthquake caused considerably more damage and loss of life in Bakersfield than did the main shock (M=7.7) one month earlier. Many people have asked how long aftershocks of the San Fernando earthquake will continue, and at what point do we no longer call shocks in this area "aftershocks." Judging from experience in other southern California earthquakes, aftershocks may continue for several years although the rapidly decreasing rate of aftershock activity suggests that the principal period of activity is already over (Table 2). At such time as the level of activity in this area attains the same low level as that which preceded the earthquake, the term " aftershock" would seem to be no longer appropriate — but that time may be several years away. The relationship of the San Fernando earthquake to the San Andreas fault — California's "master" fracture — is a matter of some conjecture among scientists, but all agree that the two are not completely unrelated. The stress system that causes movements along the San Andreas fault apparently dominates all of southern California, including the area of the San Fernando earthquake. It seems likely that the southward thrusting represented by the San Fernando shock is a result of the "great bend" in the San Andreas fault near Gorman at the south end of the San Joaquin Valley (Fig. 1), and that the difficulty in transmitting horizontal stresses around this bend results in sideward " pushing" on each side of the bend. Thus the 1952 Kern County earthquake represented northward thrusting on the north side of the San Andreas fault in the similar sense that the San Fernando earthquake represented southward thrusting on the south side. The segment of the San Andreas fault that includes the bend last broke during the great Fort Tejon earthquake of 1857. This segment currently seems to be "locked." Sometime during the next few tens or hundreds of years, the lock presumably will be broken by another great earthquake, and the San Fernando earthquake may represent one of the many smaller events that are leading up to the breaking of that lock. But whether the San Fernando earthquake hastened or postponed the day of that great earthquake is impossible to say — or at least is the subject of vigorous debate among geologists and seismologists. LW2316: 9600 dpi jpg from original report, purchased 2013 by Leon Worden.